Do false teeth make your own teeth fall out? If you need to have a number of teeth removed from the same area of your mouth, then your dentist will likely recommend a partial denture or bridge to help cover the gap created by the extraction. Patients often have worries about dentures that they don’t feel able to talk about with their dentist, or that only starts to build up as the date of the extraction occurs. One of the biggest worries for people facing the loss of two or three large teeth, and the requirements for dentures, is that it will somehow affect the remaining natural teeth. There are some reasons why these concerns might be realistic, but there are ways to combat it and to live with dentures. When you use dentures, you are essentially putting a foreign object into your mouth. This irritates the gum lines, leading to inflammation. When the gums recover, they will tend to sink back against the jaw. 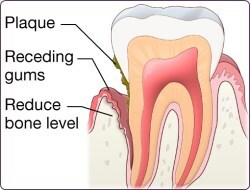 This can affect the surrounding teeth. In addition, the use of dentures can increase plaque accumulation in the teeth, which can result in gum disease and tooth decay, increasing the chances that teeth will fall out. Although gum retraction and tooth decay is a fact of life, there are some things that you can do to prevent the loss of your other teeth. Firstly, good dental hygiene is a must. You have to keep the remaining teeth in good condition, so that they are not damaged. Secondly, keeping the dentures clean is just as important. Don’t just put the denture bridge in water each night. Instead, scrub them with a toothbrush and toothpaste just as you would with natural teeth. This helps to keep bacteria to a minimum, preventing the decay of your natural teeth. Another reason why natural teeth can fall out after a denture is fitted is due to poor sizing of the dentures. If you are wearing a partial denture or a bridge that is not correctly fitted and held in place, then the denture can rub against the natural teeth, causing them to become loose. Careful fitting of the partial denture is essential to prevent this from occurring, and you can also help yourself by properly securing the denture to the gumline. You should also make sure to have your dentures replaced every two to three years in order to ensure that the dentures remain correctly fitted to your current gumline. Talk to your dentist for more advice about preventing further tooth loss when using a partial denture or bridge. Dentures are the main way for dentists to help patients who are losing their own teeth. In the perfect world, dentists are able to use implants to replace-create teeth, as this has less impact on adjacent teeth and gums. Bridges are also good replacements, as they have less plaque accumulation, but many people are uncertain about bridges as they require shaving down adjoining teeth. On the whole, dental implants are the preferred option.